Looking for a productive pet? 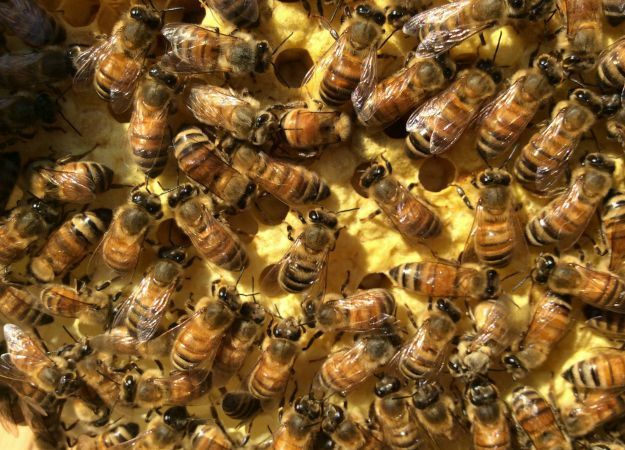 Caring for angoras could be your answer. Few people know how easy it is to care for Angoras. Angoras with their soft hair require little care to produce fine fluffy wool. Not only do they have an adorable face but they can make you some money. 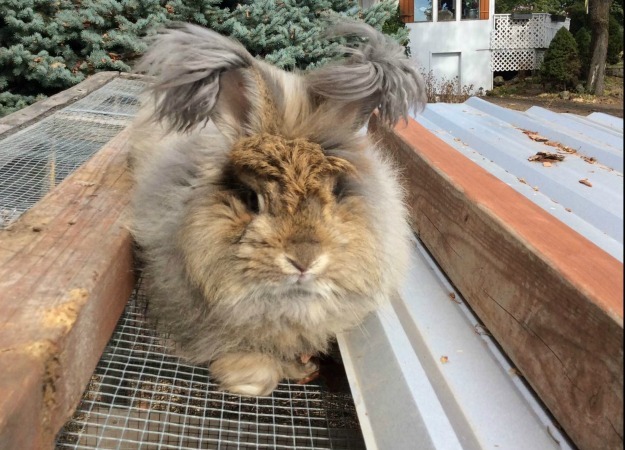 Besides producing luxurious wool, Angora poop like all bunny poop makes excellent manure. 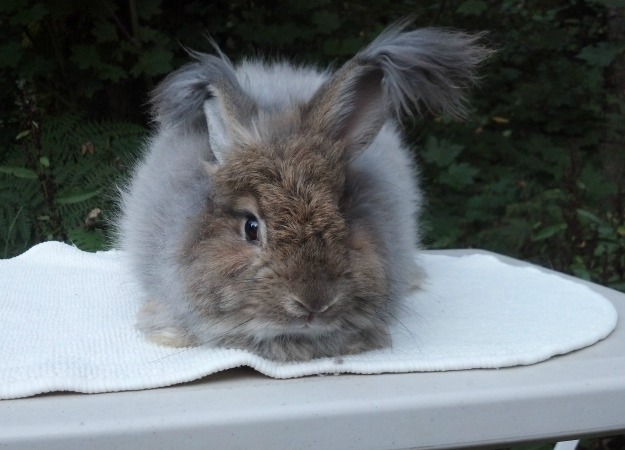 Before you get your angora there are a few things you need to know. If someone is giving away their angora for free it might be because there is something wrong with it. 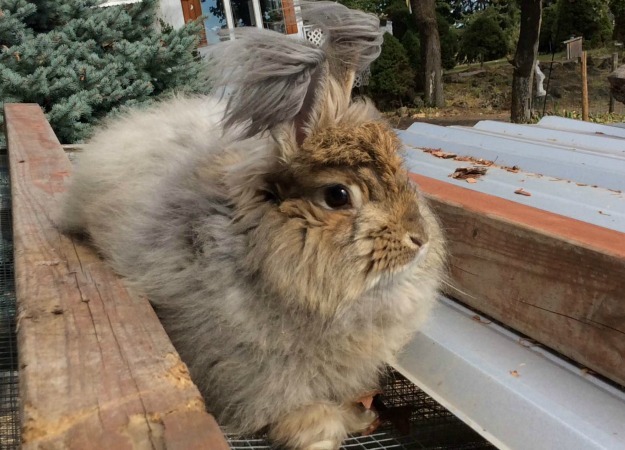 A good price for an angora is between $50 and $200. Before you bring your angora home check out its teeth and coat. Make sure its top teeth are in front of its back teeth. If a rabbit's teeth are not in this order it should have been culled after it was born. If an angora's teeth are in the wrong order the rabbit has no way of eating. The only way to feed it is to syringe-feed it soft food; producing a weak angora. 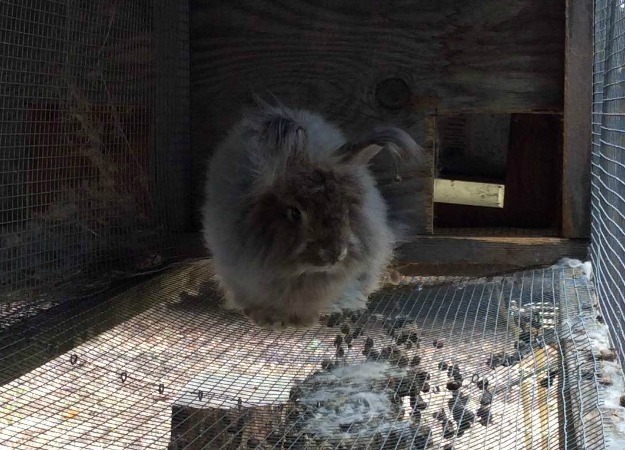 If the angora has mats, it's slipping its coat and will be hard to groom, shave and spin. You may want to pass this one up. The tell-tale sign of coat slipping is a lot of mats. Angoras need more room than an ordinary rabbit. Get an extra large cage for your bunny to groom and exercise himself. 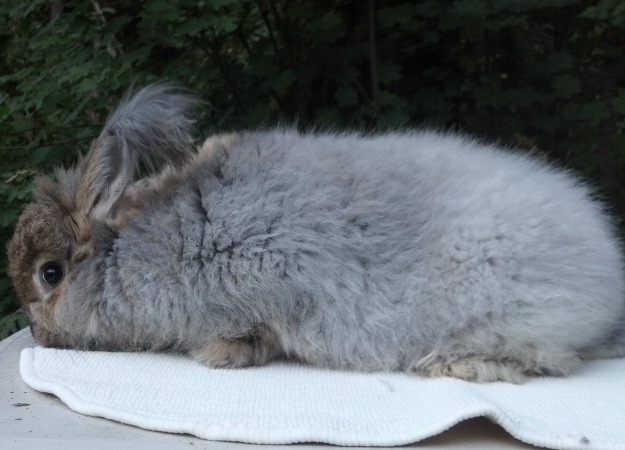 Height matters for your angora to groom himself and length matters so he can exercise. 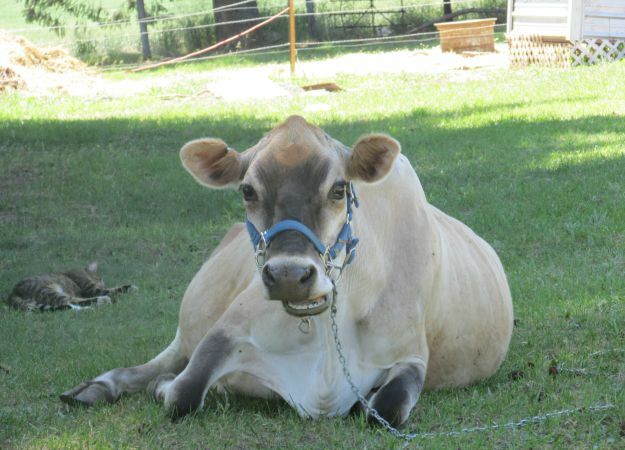 In the past, my cages were 8 feet long, 2 feet tall and 2 feet wide. Now I have XL dog kennels that I altered for my rabbits' needs. I bought them from Chewy.com. I took the bottoms out and put in wire mesh. We built a frame out of two by fours to hold six cages. Three are on top of three with tarps between the rows to allow poop to slide down the back to the ground and not on the bunny below. Bunnies also like to have a place to rest so I bought each one a mat made for rabbits on Amazon. These are a nice touch but not necessary. To prevent excessive weight gain, you can measure your rabbit's pellets. Angora's appetites may vary but feed them no more then one cup a day. For the best quality wool feed your angora a show quality feed. We have gone years feeding them regular alfalfa pellets at the feed store, but if you have access to show feed, buy that. An average size angora needs 3/4 cup of alfalfa pellets a day, while a lactating doe needs 1 1/4 cup of alfalfa pellets a day. Her babies will share the food with her. Rabbits need one of those water bottles with a ball in the tube used for rodents. But some rabbits find it hard to drink out of a bottle. If you find that your rabbit is not drinking its water, use a bowl. We had a bowl drinker for years. I filled his bowl twice a day and he did great. Angoras with their beautiful long thick hair have quite the job keeping it all clean by themselves. So why not give them a hand? 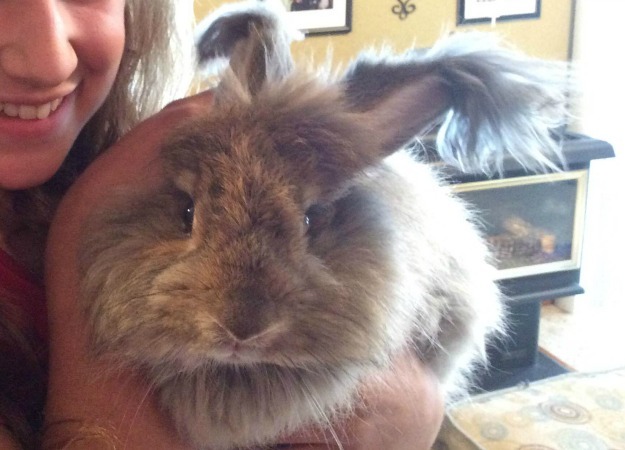 You can help your angora stay clean by brushing it once a week. Now you might think this is crazy, but actually it is a nice quiet moment for you to bond with your rabbit. And the rabbit enjoys it. Handling your angora once a week will make shearing easier. Angoras prefer the cold winter months than the hot summer ones. But in the winter time it is hard on them right after you shave them. When I shave my angoras in January I put a fleece coat on them until there hair is a little longer. But if it's the negatives I bring them down stairs to stay until the weather is not so cold. In the summer it is really hard for angoras to stay cool. I freeze 1 liter soda bottles with water and put them in the rabbit's hang-out. It is funny to see them sprawling across the bottles trying to keep cool. Rabbits make excellent, cool manure. 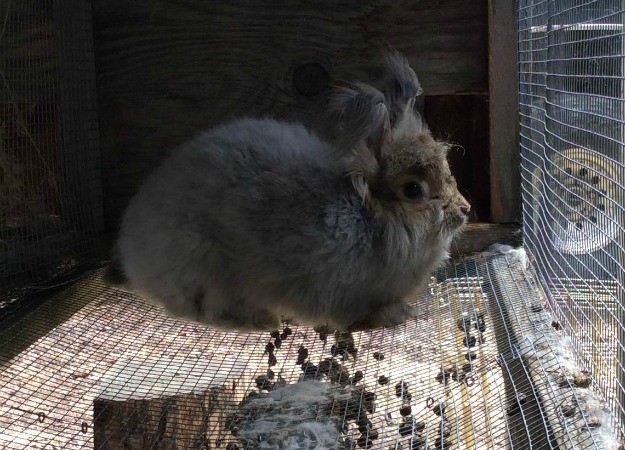 You can sift rabbit poop and sell the manure or use it in your own garden. 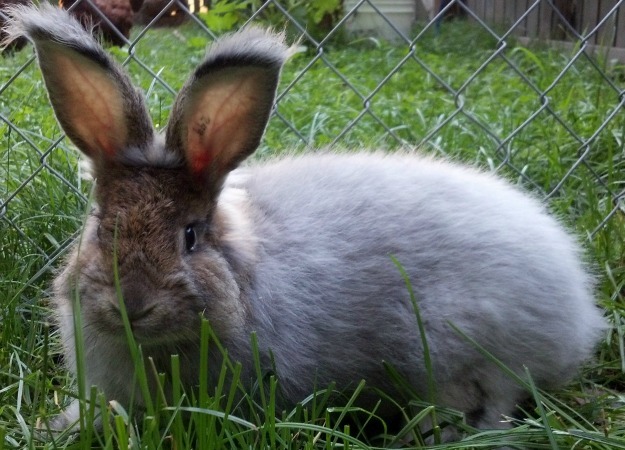 Many people know that rabbit poop is really good for gardens. But few know how to get it without getting the hair, food and bedding that might come with it. Well let me tell you how this can be done. With the 2x4 make a box the size of your wheel barrow. Staple the mesh wire on one side. This is your sifter. Step #1 Shovel your poop into a pile on top of cement or a tarp. Our cages are open on the bottom and the droppings fall directly onto clean tarps. This set up works great. Step #2 Scoop a shovel full of poop onto your sifter that has been placed on top of a wheelbarrow. #5 We fill old feed bags to store the rabbit poop until it is needed for our own use or to sell. Rabbit poop is available in our online store. Click here to buy a bag of cool rabbit manure. There is so much more I could tell you about caring for angoras, in fact, I've only just covered the basics. If you have any questions about angoras please feel free to ask them! I will try to answer your questions as quick as possible. Ask your questions in the form below, and if you have a picture, I want to see it! When using scissors there is more of a chance of cutting your angora. But here is a tip to using scissors. Put the blade of your scissors under the wool you are going to cut. Make sure you see both ends of the blade. Tilt your scissors slightly up. You are now safe to snip. It's OK if you held your breath the whole time. It's also OK if you do cut your rabbit. Every angora owner has in his lifetime.